Petty cash is a convenient way to cover small expenses but without the proper documentation, a company’s petty cash program can be abused or mismanaged. 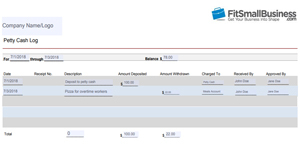 Managing petty cash means providing a petty cash form for each use and recording every transaction in a petty cash log. Using our free petty cash templates will make this easier. Many small businesses are moving away from traditional petty cash and instead opting for prepaid business cards. Using a prepaid card, like Bento, allows you to load funds, set spending limits and turn cards off and on with the click of a button. Plus, you can upload receipts using the mobile app and download your transactions into QuickBooks. Try them for free for 60 days. Download our free petty cash form and petty cash log template here. Then keep reading to learn how to use the templates to effectively manage your company’s petty cash. Petty cash is money that is set aside to take care of small business expenses that come up from time to time (e.g., if you need to purchase postage to mail a package or if you decide to buy lunch for the office one day). It’s easier to pay such expenses in cash as opposed to having an employee use their personal credit card and then having to reimburse them later on. The amount set aside for petty cash will vary with the size of the business and how often these small expenses come up; generally anywhere between $100 and $500 can be kept in the petty cash fund. A petty cash book is the “old school” way of keeping track of withdrawals made to the petty cash fund. 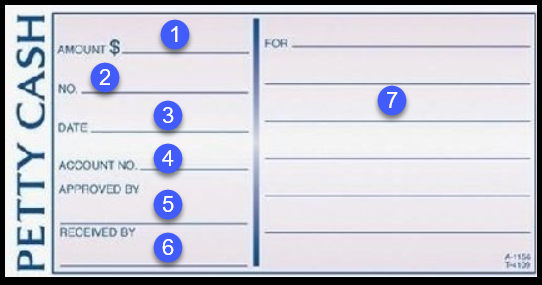 Below is a sample form you will find in a petty cash book. This should be completed by the person responsible for managing petty cash and signed by the person making the petty cash request. Amount – The amount of the funds disbursed belong in this field. 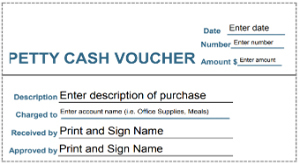 Voucher Number – You can assign a number to each voucher, but it is not required. Date of Purchase – The date the funds were issued. Account Name/Number – The type of purchase belongs in this field so that the financials can be recorded correctly (e.g., meals, office supplies, etc.). Approver – The signature of the person in charge of the petty cash fund belongs here. Receiver – The signature of the person who received the funds belongs here. Description – A brief explanation of what the funds were used for belongs here. Petty cash books can be purchased from Amazon for around $10. This works great if you have multiple petty cash requests throughout the day and prefer to jot them down as opposed to typing them up on the computer. A petty cash log is a detailed account of every deposit and withdrawal from the petty cash account, including the date of purchase, a description of what was purchased, the account it should be charged to, who received the funds, and who approved it. In general, you should keep one petty cash log template per month. I recommend that you keep them all in one Excel workbook so that they are easy to find. Download this free Petty Cash Log template and make the necessary modifications to meet your business needs. A petty cash voucher (aka petty cash form) is a form that is completed each time a withdrawal is made from the petty cash account. 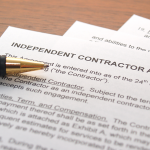 It can be completed by the person who received the cash or the approver. Both parties must sign the voucher before the funds are withdrawn. In turn, the recipient is responsible for providing a petty cash receipt along with any change left over from the purchase. The petty cash form will include the date the funds were issued, a voucher number (optional), the amount, a brief description of the purchase, the account to be charged, and the signature of both the recipient and approver. Download this free Petty Cash Voucher and make any changes necessary to meet your specific business requirements. Now that you know how petty cash works and are familiar with the various ways to document a withdrawal from petty cash, you’re probably wondering how you make sure all of this information is properly recorded on your books. There are a couple ways to record petty cash: manually using a petty cash log template in Excel or in an accounting software like QuickBooks. If you use an Excel spreadsheet to record your financial transactions, then you need to create a journal entry to record all of your petty cash transactions. In general, you will debit the expense accounts of the purchases made (e.g., meals, office supplies, postage) and you will credit the petty cash account. 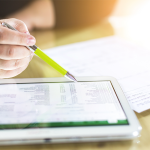 For detailed step-by-step instructions on how to record petty cash in QuickBooks, check out our Petty Cash Accounting guide. You will also find tips and best practices for managing petty cash. While it’s convenient to use cash for small purchases, it’s actually the riskiest way to manage petty cash. These traditional petty cash systems just leave too much room for human error or outright theft. Fortunately, petty cash alternatives, like prepaid business cards and unsecured business credit cards, give small business owners more control over spending and easier accounting integration. With prepaid business cards, you can control the amount that is spent since you determine how much you want to load on each card. You can also approve the types of purchases that can be made (e.g., office supplies or postage). One of the best business prepaid cards we recommend is Bento. Getting started with Bento is easy and they are currently offering 60 days free. Business credit cards are another way you can pay for business expenses while also keeping track of all charges. Unlike prepaid cards, your credit history and business financials will determine your credit limit. Credit cards are ideal if you need an expense solution for more than just petty cash (like travel) and have senior employees you can trust with a credit card. Once you start issuing employee credit cards, it’s a good idea to formalize a company credit card policy. Check out our Best Small Business Credit Card guide to find a card that’s right for you and your business. Whether you decide to go with a prepaid business card or a business credit card, you don’t have to worry about keeping manual petty cash logs or vouchers. You can easily access your statements online to review all expenses and download them to your software to record them. Now that you are familiar with petty cash procedures and have all of the tools you need to track and log petty cash, you’ve got to decide which method to use. Is it worth it to continue to manually track these type of small business purchases or should you just get rid of the petty cash box and try using prepaid debit/credit cards instead. Issuing a prepaid business card like Bento would simplify the ability to manage petty cash. You can set different spending limits for each person, department, or location. Alerts can be set up to notify you when someone is trying to make an unauthorized purchase, a petty cash receipt can be easily uploaded using the mobile app so that it doesn’t get lost, and best of all, you can download transactions into QuickBooks, eliminating the need for manual entry.